Julia from Hooked on Houses is having a Holiday House Tour today. I love Julia's parties! Today I'll show you a bit of my kitchen all dressed up for Christmas. If you'd like to see more of my kitchen, click here. And now for some of our Christmas touches in the kitchen. I get them out every Christmas, and they set the tone for our kitchen decor. and over in my Mom Corner. One of my favorite things about my kitchen is that the screened porch is adjacent to it. I don't go to much trouble to decorate the porch, but I do add a few things to make it festive. There are a few things you can't see in these photos. . . like the pile of ornaments that have NOT been made into ornament wreaths. Yet. Or maybe ever. 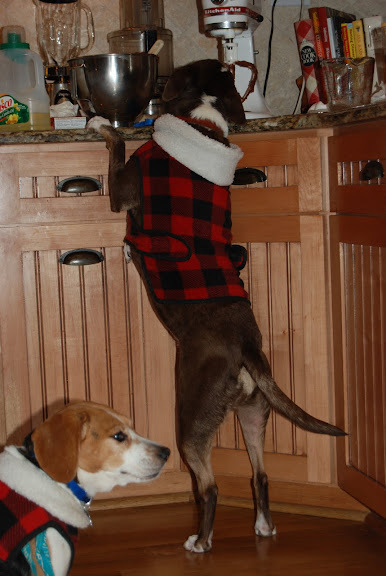 Do you think Snickers the beagle is standing guard, or just waiting her turn? Thanks for joining me for a look at my Christmas kitchen! Ahhhh! Your PORCH! Wow. And I love the doors. Your decor is so warm and festive too!! Our dog Winston stole cookie dough right off the cookie sheet this year. He is getting bolder in his old age, he never would have done that when he was younger. I think he learned some bad tricks along the way from his cousin (dog) lol! So funny! The dogs made me laugh!! Love the lanterns in your porch and I especially love the lamps on each side of your sink - unique idea!! Happy Holidays to you! 1. I love the rusty snowmen! 2. I really love that you have Lee's Lego creation on the table. To me, that says you are down to earth, care about your family, and you don't take yourself too seriously. Your kitchen is just plain old beautiful! I love your curtain fabric, counters, cabinets, and the two lamps by your sink. I never would have thought to do that. Your snowmen plates are so cute. I'll bet that your boys look forward to seeing them each year. Hi! This is the first time I've visited your blog and loved it. I also have 3 sons (33, 32, 30) and they are now married. (and 10 grandchildren from 7 to 4 months). Your Christmas decorations are so inviting. I loved the lego the best and I could relate to it! Last year my youngest son found his old "superheros" and placed them strategically all within my Snow village houses to see if I'd notice! ha ha. Of course I did! God bless you this Christmas season! Your porch is beautiful, and I love the dog helping himself to goodies. Hello! Im your newest follower and LOVE your blog! Come join another Christmas linky and would love for you become my new friend! Where/how in the world did that Lego Set turn into a village--that is extremely creative! I think with a name like Snickers, she must be waiting her turn for some goodies. Your puppers are too cute! in your kitchen. That added just the perfect touch. Our son is 38 and our daughter is 31. And we have grandbabies. Love all your decorations, but mostly the lego display! It reminds me of a year my son made me a big lego heart and a small santa. I still put it out as part of my decor every year and he is now 25! I love you put candles in the 6 glass holder thingy (I don't know what it's called). I always see those at thrift stores and never get one because I don't know what to do with it! Look great. I love snowmen too. I like the legos out too!! Your home looks so warm and all ready. I adore that sun porch, it is awesome! You really have it decorated cute too. Happy Holidays to you and your lovely family. LOL at Snickers and the other "thief", Richella! I think Snickers is supposed to be the look-out, but apparently failed since they were caught on camera! 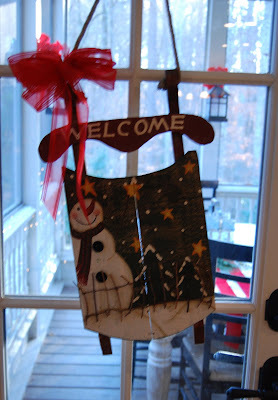 : ) Love your decorations and you're a girl after my own heart ~ I have snowmen all over the place at my house, too. Can you believe I didn't even realize I had a "collection" until last year! ?